Call it trickle down performance. 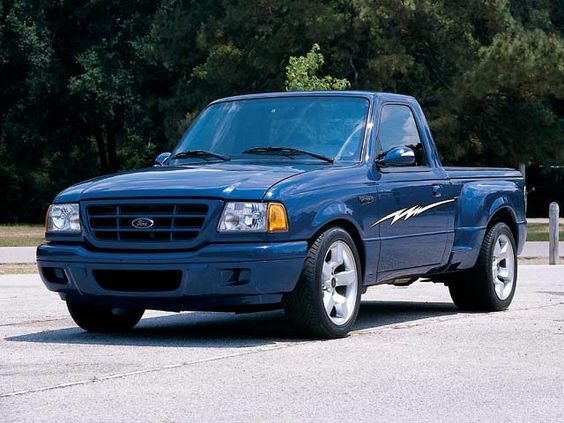 After all the years of attention and engineering paid by Ford to the superb SVT Lightning F-150 muscle truck, some of that high-octane magic has finally reached Ford’s compact pickup in the form of the SVT Lightning Bolt Ranger concept. Dempster approached O.J. “John” Coletti, SVT’s engineering director, for project approval. “I think you’ve gone over the edge!” is what Dempster remembers from Coletti’s initial comments about the Lightning Bolt but Coletti immediately gave the project the green light under the mantle of SVT’s performance research mandate. 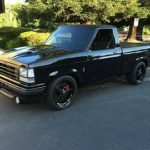 Next up was the Ford Ranger that would be transformed by Dempster and his team into the Lightning Bolt – a black regular cab, style side 2.5-liter I4 automatic. 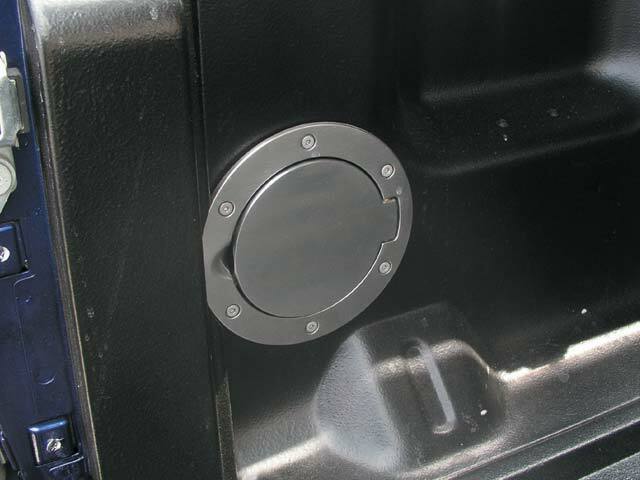 As much as possible, off-the-shelf hardware was used to keep build and fabrication costs down. 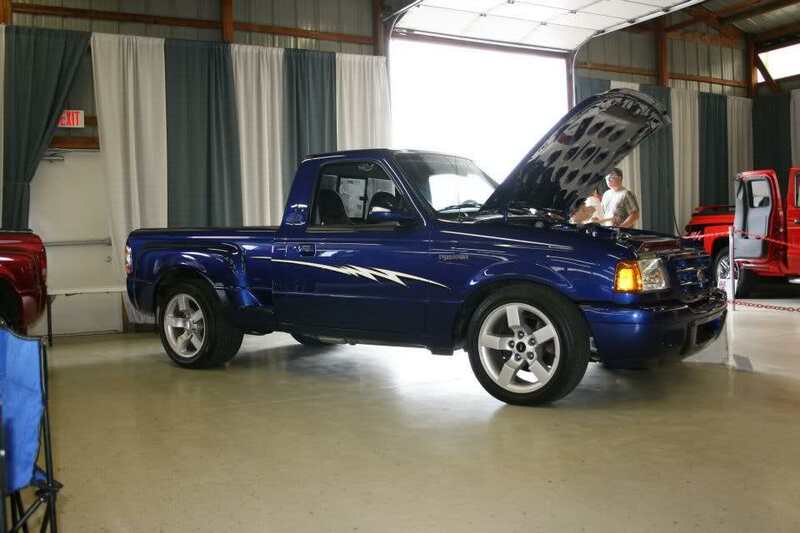 The Ranger’s engine and transmission were replaced with the same 5.4-liter supercharged engine and automatic transmission used in the SVT Lightning, even though the compact Lightning Bolt weighs in at 1200 pounds less than its big brother. 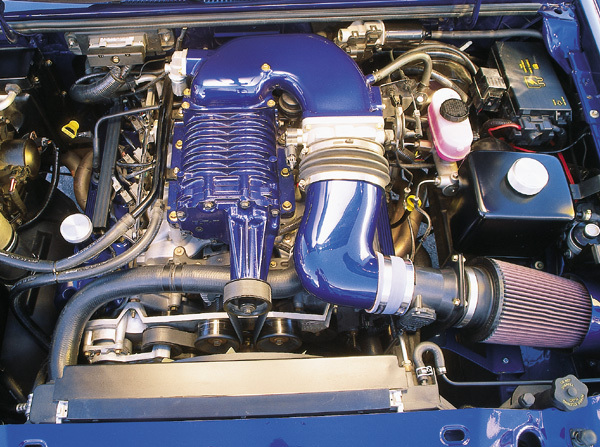 Custom 2-foot headers, a K&N air filter and the relocation of the supercharger’s air inlet to accommodate the Ranger’s unique air entry position were the only material changes to the stock powerplant. 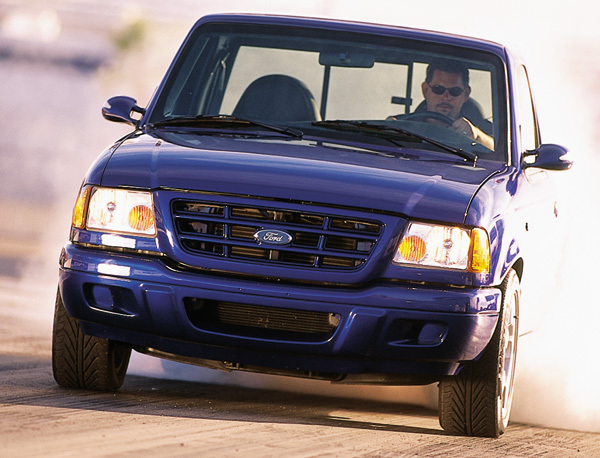 The exhaust system was modified with stainless steel and Borla Super Pro mufflers resulting in a power boost from 380hp and 450lb-ft to an estimated 400hp and 460lb-ft. Handling all of this power also meant replacing the Ranger’s stock driveshaft with a shortened 3-foot aluminum version from the Lightning. 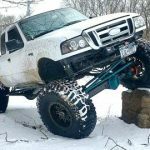 As the powertrain transplant was going on, the Ranger was torn down right to its chassis. 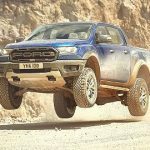 The frame rails were boxed and cross-braced in several areas to handle the almost 300lb-ft increase in torque between the Ranger’s 153lb-ft I4 and the Lightning Bolt’s V8. 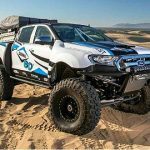 These chassis modifications also “necessitated the removal of the production plastic longitudinal fuel tank and an aft axle fuel cell was fabricated requiring moving the fuel access door to the rear of the vehicle” according to Dempster. 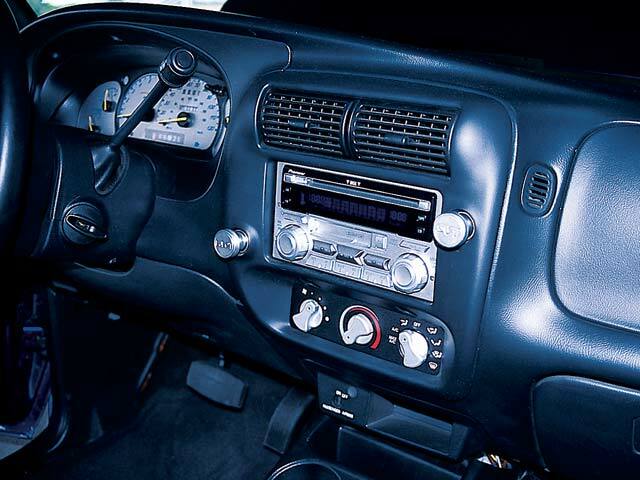 The production Ranger’s rack and pinion steering gear was retained but the power steering pump was replaced with one from a Lightning for better steering feedback. A custom steering shaft was required to clear the new headers. 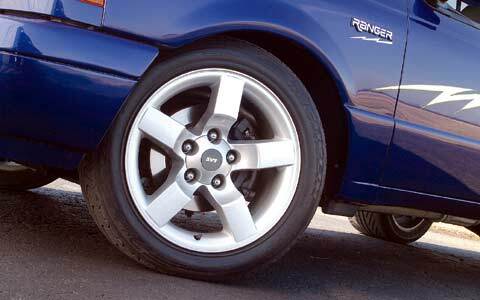 Continuing the migration of Lightning parts to the Ranger, the ‘Bolt wears the same edgy 5-spoke aluminum wheels but they were widened to 12-inches in the rear to seat the massive 345/35ZR18s Michelin tires and narrowed to 8-inches up front to handle 235/40ZR18s. Production brakes from the Lightning easily stop the lighter Ranger. 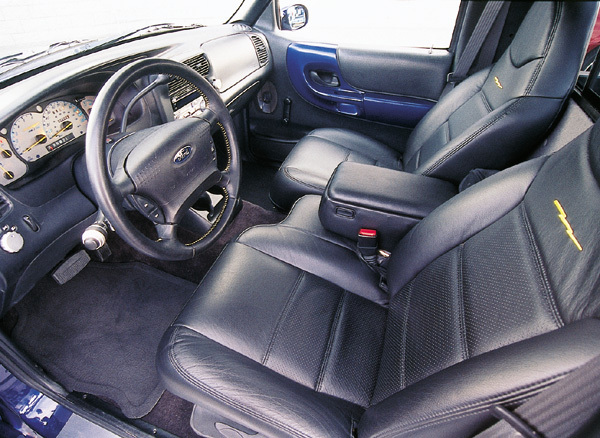 Inside the Lightning Bolt the Ranger seats were reskinned with black custom leather courtesy of Katzkins Creations. 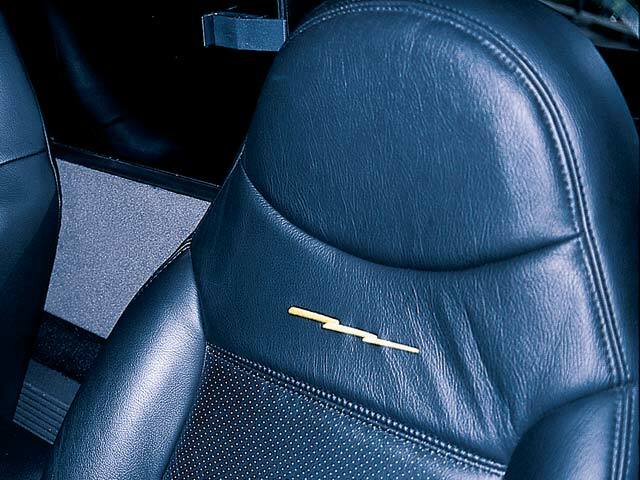 The seats have embossed lightning bolts between the seatbacks and headrests. 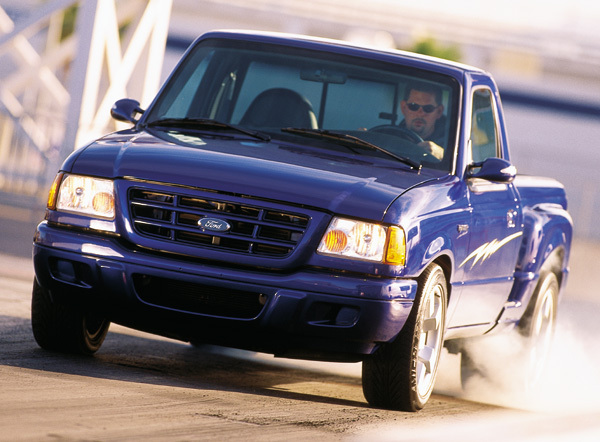 The exterior was painted in Ford’s new sonic blue color – even though it looks kind of purplish. The clear taillights and body painted mirrors come from Car Boutique. 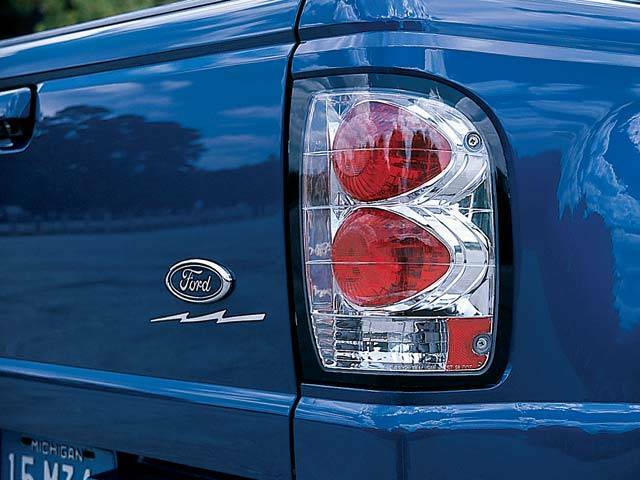 To finish off the SVT Lightning Bolt Ranger, custom lightning bolt graphics were added to the doors. 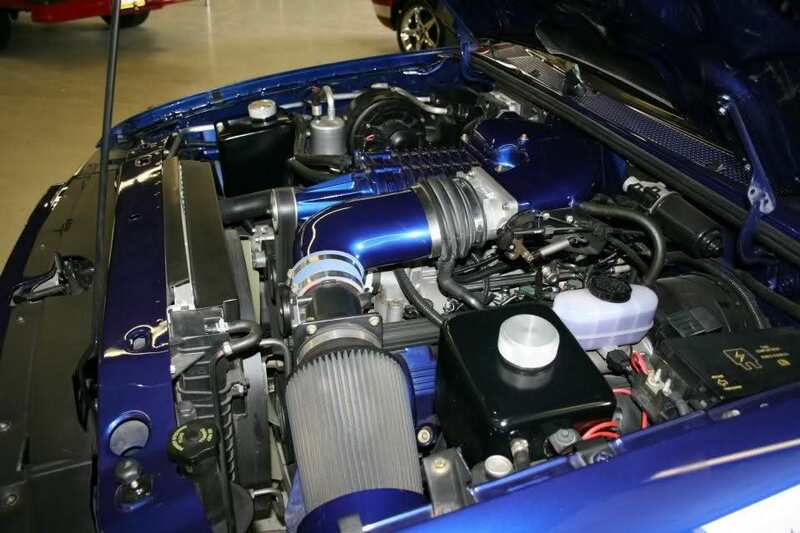 The supercharger, air intake and other engine components were also painted sonic blue in a nice touch of detailing. After walking around and learning about the history of the Lightning Bolt we finally had a chance to get behind the wheel and take it for two runs down Las Vegas Motor Speedway’s dragstrip. 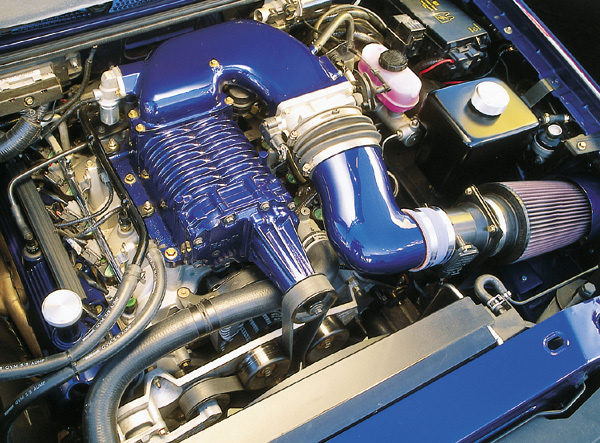 The headers and exhaust sang low but refined notes as the engine rumbled to life with a turn of the key. 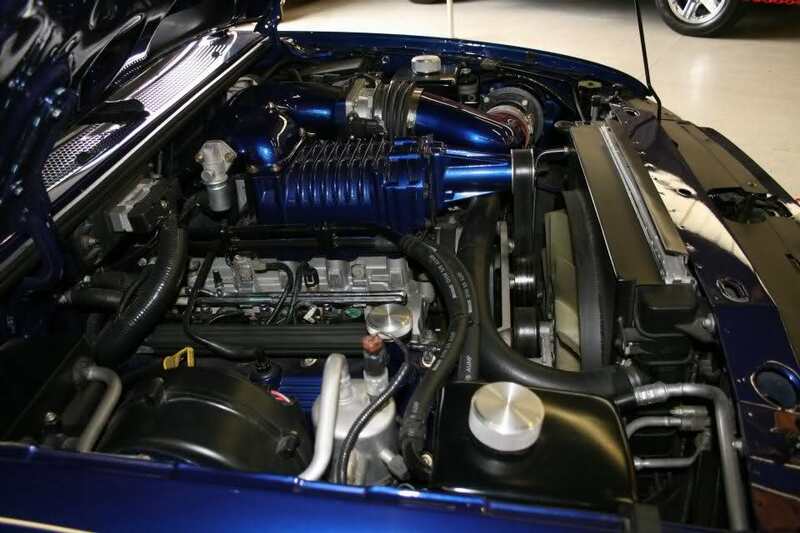 It’s only a subtle clue though to the power under the hood. 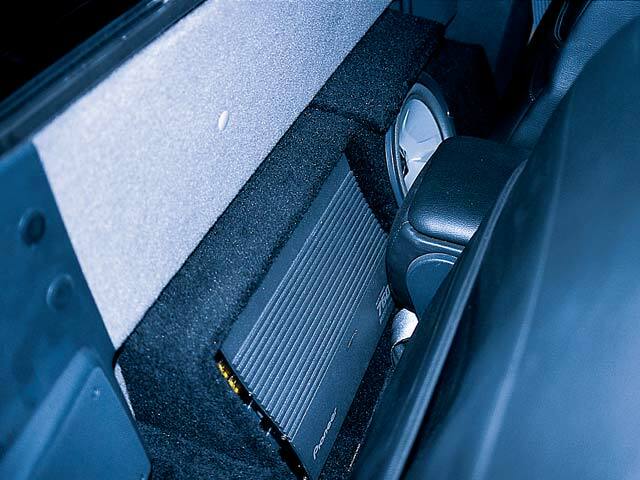 The instructions from Dempster were to not “immediately hammer down on the pedal at the green” but to firmly and consistently apply the accelerator until you reached the floor over a time span of about 1.5 seconds. 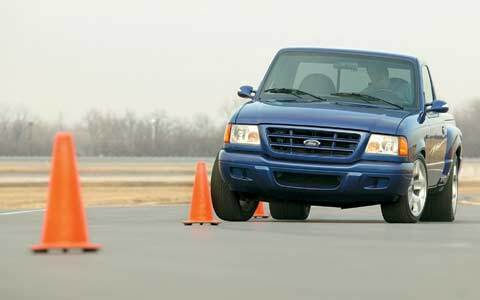 Woe to those journalists who didn’t listen to this bit of advice because they quickly found the rear tires spinning and smoking while the truck stood still and spectators ogled or the stump pulling torque began forcing them right into the other lane until they let off on the pressure they were applying to the pedal. Let me just say that my first run was great. Not perfect, but great. 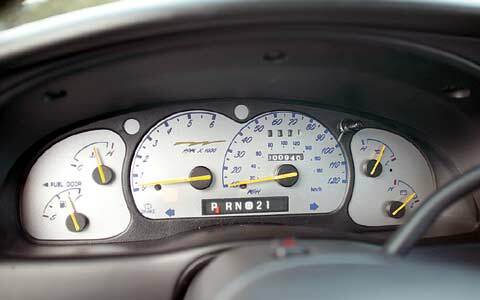 I lined myself up next to a stock Lightning for the ¼-mile sprint and when the lights turned green at the bottom of the “Christmas tree” I hit the pedal just like Dempster suggested and within the first few feet I pulled away from the Lightning and reached the end of the track in 13.8 seconds at 102mph. 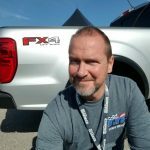 The whine and roar of the 5.4-liter easily penetrated my helmet and if there had been a passenger next me in the truck they could have seen my grin right through my Nomex balaclava. 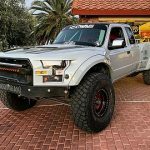 This is one sweet truck! In between runs in the Lightning Bolt (they practically had to pry the keys out of my hand after the first run) I jumped into a 2003 Lightning for comparison. 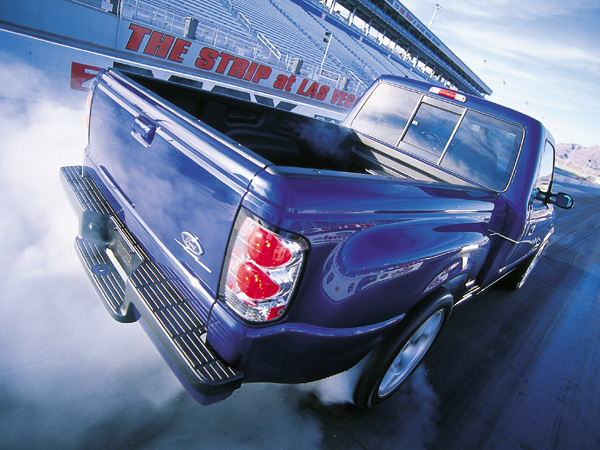 The Lightning remains the performance champ among production pickups and it demonstrated its racing prowess by doing the ¼-mile in 14.1 seconds at 99mph. 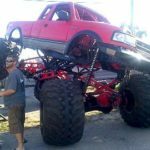 SVT should be rightfully proud of what they have done to move a full size truck over a ¼-mile so expeditiously. My second run in the Lightning Bolt can only be described as sub-par. Don’t ask me what I was thinking but at the green I was asleep at the wheel and didn’t snap back to reality for about a full second. Meanwhile, a 2003 Mustang Mach 1 (305hp / 320lb-ft V8) in the lane next to me was quickly becoming a set of ever-smaller taillights. But the Lightning Bolt was about to demonstrate just how incredible it truly is as a street racer. As I accelerated the Mustang was about 2 car lengths ahead of me. By half way down the track we were neck and neck and at the end of the ¼-mile the Lightning Bolt handily beat the Mustang. The SVT Lightning Bolt Ranger is one hell of a fun and capable ride. 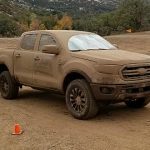 So, how likely is it that the Lightning Bolt Ranger will see actual production? Not very. 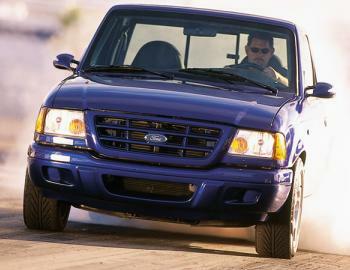 The SVT Lightning Bolt Ranger remains only a concept at this point. But you never know. Even the biggest floods start with a small trickle.